Basel, November 10, 2017 - Novartis, a global leader in ophthalmology, announced further positive results from two Phase III studies of brolucizumab versus aflibercept. Results showed non-inferiority in primary endpoint, superiority in key retinal health outcomes, and long-lasting effect in patients with neovascular age-related macular degeneration (nAMD), a leading cause of blindness. The results of the head-to-head trials, HAWK and HARRIER, were presented at the American Academy of Ophthalmology (AAO) 2017 Annual Meeting. In neovascular AMD, abnormal blood vessels leak fluid into the eye, ultimately causing damage and blindness. At week 16, relative to aflibercept, 35% fewer brolucizumab 6 mg patients showed presence of IRF and/or SRF in HAWK, and 33% fewer in HARRIER (P<0.0001 for both). Again at week 48, relative to aflibercept, 31% fewer patients on brolucizumab 6 mg had intra-retinal fluid (IRF) and/or sub-retinal fluid (SRF) in HAWK, and 41% fewer in HARRIER (P<0.0001 for both). The absence of fluid for patients in the brolucizumab arm suggests the potential for a long-lasting effect and decreased treatment need. Additionally, brolucizumab 6 mg patients demonstrated superior reductions in central subfield thickness (CST). In nAMD, an elevated CST-as measured by optical coherence tomography (OCT)-is a key indicator of abnormal fluid accumulation in the retina. Significantly improved CST reductions were evident at week 16 (P=0.0016 in HAWK and P<0.0001 in HARRIER) and at week 48 (P=0.0023 and P<0.0001, respectively). Brolucizumab met the primary efficacy endpoint of noninferiority to aflibercept in mean change in best-corrected visual acuity (BCVA) from baseline to week 48 in both trials. These results were achieved while a majority of brolucizumab patients-57% in HAWK and 52% in HARRIER-were maintained on a q12w dosing interval immediately following the loading phase through week 48. 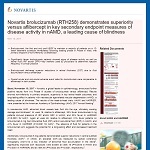 "HAWK and HARRIER demonstrated that brolucizumab has the potential to positively impact disease management and provide long-lasting treatment effect," said Dr. Pravin U. Dugel, Managing Partner, Retinal Consultants of Arizona; Clinical Professor, Roski Eye Institute, Keck School of Medicine, University of Southern California; and principal investigator of both trials. "HAWK and HARRIER showed that brolucizumab outperformed aflibercept on disease activity assessments, including key measures of disease progression seen on OCT, which forms the basis of a clinician's treatment decisions. Importantly, improvements in these key OCT measures were seen as early as week 16 and maintained at week 48, with a majority of brolucizumab patients on a 12-week treatment interval." Frequent injections into the eye, a standard requirement for nAMD therapies, can be a significant hardship for patients and burden on caregivers,. Brolucizumab is the first and only anti-vascular endothelial growth factor (anti-VEGF) treatment for nAMD to demonstrate robust visual gains with a majority of patients maintained on a less-frequent 12-week (q12) treatment interval immediately following the loading phase in randomized clinical trials. "Having delivered on our non-inferiority endpoint with a majority of patients on a q12 week interval, we're truly excited to share these data showing that brolucizumab clearly improves key anatomical outcomes that are biomarkers of disease," said Vas Narasimhan, Global Head, Drug Development and Chief Medical Officer, Novartis. "Brolucizumab represents a major scientific and clinical advancement for patients, caregivers and retina specialists around the world." With brolucizumab, significantly fewer patients had active disease at week 16 in a matched head-to-head comparison. Active disease was observed in 23.5% of brolucizumab 6 mg patients versus 33.5% of aflibercept patients in HAWK, and in 21.9% of brolucizumab patients versus 31.4% of aflibercept patients in HARRIER (P=0.0022 for both). Brolucizumab safety was comparable to aflibercept with the overall incidence of adverse events balanced across all treatment groups in both studies. The most frequent ocular adverse events (greater than 5% of patients in any treatment arm) for brolucizumab 3 mg, 6 mg and aflibercept, respectively, in HAWK were reduced visual acuity (8.7%, 6.9% and 8.9%), conjunctival hemorrhage (8.4%, 6.4% and 5.6%), vitreous floaters (6.7%, 5.0% and 3.1%) and eye pain (5.9%, 4.4% and 4.2%). The incidences of these events for brolucizumab 6 mg and aflibercept, respectively, in HARRIER were reduced visual acuity (5.9% and 6.2%), conjunctival hemorrhage (1.9% and 3.3%), vitreous floaters (3.0% and 0.8%) and eye pain (2.7% and 3.3%). The most frequent non-ocular adverse events were typical of those reported in an nAMD population; there were no notable differences between arms. The incidence of arterial thrombotic events (ATE) was 3.9%, 2.5% and 5.6%* (brolucizimab 3 mg, brolucizumab 6 mg and aflibercept respectively) in HAWK and 2.7%* and 4.3%* (brolucizumab 6 mg and aflibercept, respectively) in HARRIER. *Since publication, a minor numerical error has been corrected; this has no impact on the overall safety conclusion. The proprietary innovative structure results in a small molecule (26 kDa) with potent inhibition of, and high affinity to, all VEGF-A isoforms,. In preclinical studies, brolucizumab inhibited activation of VEGF receptors through prevention of the ligand-receptor interaction,,,. Increased signaling through the VEGF pathway is associated with pathologic ocular angiogenesis and retinal edema. Inhibition of the VEGF pathway has been shown to inhibit the growth of neovascular lesions, resolve retinal edema and improve vision in patients with chorioretinal vascular diseases. With more than 1,800 patients across 400 centers worldwide, HAWK and HARRIER are the first and only global head-to-head trials in patients with nAMD that prospectively demonstrated efficacy at week 48 using an innovative q12w/q8w regimen, with a majority of patients on q12w immediately following the loading phase. Both studies are 96-week prospective, randomized, double-masked multi-center studies and part of the Phase III clinical development of brolucizumab,. Week 16 was an important pre-defined data point, as it represents a timepoint when the treatment assessment for brolucizumab and aflibercept were identical, providing an opportunity to observe how both drugs performed in a matched comparison. NHS Choices. Macular Degeneration. Available at http://www.nhs.uk/Conditions/Macular-degeneration/Pages/Introduction.aspx (link is external). Accessed November 2017. Kang SW, et al. The correlation between fluorescein angiographic and optical coherence tomographic features in clinically significant diabetic macular edema. Am J Ophthalmol 2004;137(2):313-322. Mantel I. Optimizing the Anti-VEGF Treatment Strategy for Neovascular Age-Related Macular Degeneration: From Clinical Trials to Real-Life Requirements. Translational Vision Science & Technology. 2015;4(3):6. Gohil R, et al. Caregiver Burden in Patients Receiving Ranibizumab Therapy for Neovascular Age Related Macular Degeneration. PLoS ONE. 2015;10(6):e0129361. Escher D, et al. Single-chain antibody fragments in ophthalmology. Oral presentation at EURETINA congress. 2015. Abstract. Available at: http://www.euretina.org/nice2015/programme/free-papers-details.asp?id=4072&day=0 (link is external). Accessed November 2017. Gaudreault J, et al. Preclinical pharmacology and safety of ESBA1008, a single-chain antibody fragment, investigated as potential treatment for age related macular degeneration. ARVO Annual meeting abstract. Invest Ophthalmol Vis Sci 2012;53:3025. http://iovs.arvojournals.org/article.aspx?articleid=2354604 (link is external). ClinicalTrials.gov. Identifier NCT02307682. Available at https://clinicaltrials.gov/ct2/show/NCT02307682 (link is external). Accessed November 2017. ClinicalTrials.gov. Identifier NCT02434328. Available at https://clinicaltrials.gov/ct2/show/NCT02434328 (link is external). Accessed November 2017. Schmidt-Erfurth U, et al. Guidelines for the management of neovascular age-related macular degeneration by the European Society of Retina Specialists (EURETINA). Br J Ophthalmol. 2014;98:1144-1167. Chopdar A, et al. Age related macular degeneration. BMJ. 2003;26(7387):485-488. World Health Organization. Priority eye diseases: Age-related macular degeneration. Available at http://www.who.int/blindness/causes/priority/en/index7.html (link is external). Accessed November 2017. National Eye Institute. Facts About Age-Related Macular Degeneration. Available at https://nei.nih.gov/health/maculardegen/armd_facts (link is external). Accessed November 2017. NHS Choices. Macular degeneration - Symptoms. Available at http://www.nhs.uk/Conditions/Macular-degeneration/Pages/Symptoms.aspx (link is external). Accessed November 2017.